IRVINE, CA--(Marketwired - Nov 13, 2013) - La Cresta by Brookfield Residential, the finest and final new home offering within the Villages of Irvine's® award-winning Village of Woodbury™ was exceptionally designed for the most discerning lifestyles. A single-family neighborhood that epitomizes residential beauty, prestige and architectural refinement, no detail has been overlooked to ensure La Cresta's extraordinary appeal. Take a personal tour of the stunningly decorated model residences today to experience firsthand the grand interior spaces, expansive yards and high caliber of amenities that distinguish La Cresta from other luxury collections. "Sophisticated consumers who desire the ultimate new home opportunity appreciate that La Cresta is a rare and exceptional address within the Village of Woodbury -- one of Irvine's most sought-after communities," said Rocky Tracy, Vice President of Sales for Brookfield Residential. "Every element of La Cresta has been superbly crafted to offer buyers the finest environment to plan their future. Interiors are graced with dramatic staircases, the convenience of oversized walk-in showers in the master baths and European white raised-panel cabinetry. The professional-caliber kitchens are superbly equipped with Wolf stainless steel appliance packages, including a 48" gas range top with six burners plus griddle, expanded prep kitchen, granite countertops and a spectacular island with seating for four or more." "These features reflect the sophistication of each La Cresta residence and homebuyers who desire only the best realize this new neighborhood in the Village of Woodbury is indeed a once-in-lifetime opportunity to achieve their most aspirational goals for Irvine living," Tracy added. Currently selling from the mid $1 millions, La Cresta presents stunning two-story home designs that range from approximately 3,622 to 4,098 square feet, with 4 to 6 bedrooms, up to 5.5 baths and 2-car extra-deep oversized garages with storage. Architectural highlights that reveal the neighborhood's coveted luxuries include covered outdoor living rooms with optional kitchens, expansive second-floor family retreats, unique first-floor living suites with separate access plus optional kitchenettes, libraries and master suites with spa-inspired baths. 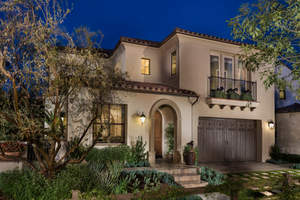 Homebuyers are encouraged to visit La Cresta within the Village of Woodbury and register their interest as soon as possible at BrookfieldSoCal.com to begin the important pre-qualifying process online. La Cresta homeowners enjoy immediate access to a variety of resort-inspired parks, including Date Palm Square, which is within walking distance and Woodbury™ Town Center and just a short stroll from home. The award-winning Woodbury Elementary School is also an easy walk from La Cresta, an important consideration for families with young children. The award-winning Village of Woodbury™, within the Villages of Irvine, was inspired by classic American small towns and villages of the past. A traditional grid design encompasses unique "districts" of residential homes, highlighted by 16 neighborhood parks positioned around "The Commons" -- a 30-acre central gathering place with athletic fields, a tot lot, recreation center and swimming pools close to miles of open space trails and paseos, award-winning schools, diverse shopping and dining, and much more. Created by Irvine Company Community Development, the Village of Woodbury is located in the City of Irvine. The City of Irvine was recently ranked by Money Magazine as the "6th Best Place to Live in America." The highly-acclaimed master-planned community is renowned for allowing residents to enjoy a unique lifestyle unmatched in the region -- some of the best schools in the state; America's safest city for eight straight years; abundant open space, parks and recreational opportunities; and world-class dining, entertainment and employment. For more information about the Villages of Irvine, visit VillagesofIrvine.com. To visit La Cresta within the Village of Woodbury from the I-5 or 405 Freeway, exit Jeffrey Road and head east. Make a right on Trabuco Road and a left on Keystone. Make a right on Regal, another right on Mapleton, and follow the signs to the model homes, which will be on your left-hand side. The La Cresta Sales Office and Model Homes are open daily from 10 a.m. to 5 p.m. and Wednesdays from 2 p.m. to 5 p.m. For more information, please call 800.320.6047 or visit BrookfieldSoCal.com. Brookfield Residential Los Angeles is a premier lifestyle provider comprised of a dedicated, knowledgeable team of professionals with the passion and experience to craft exceptional new homes, neighborhoods and communities. From the goals of first time buyers to the prestige of luxury homes, we are proud to offer opportunities that embrace a diversity of aspirations. Respected as an award-winning innovator, we are recognized for delivering consistent quality, design details and an outstanding customer experience. Please visit BrookfieldSoCal.com for more information. Brookfield Residential Properties Inc. is a leading North American land developer and homebuilder with operations in eleven major markets. We entitle and develop land to create master-planned communities and build and sell lots to third-party builders, as well as to our own homebuilding division. We also participate in selected, strategic real estate opportunities, including infill projects, mixed-use developments, infrastructure projects, and joint ventures. Brookfield Residential is listed on the NYSE and TSX under the symbol BRP. For more information, visit BrookfieldRP.com. Discover La Cresta - the finest and final new home opportunity within the Village of Woodbury, Irvine.